As any backyard gardener knows, those who choose to grow cucumbers are swamped with them at this time of year. The bins at the farmers’ markets and at the supermarkets overflow with them, too. But there’s only so much Greek salad and Polish cucumber salad you can eat. Whatever to do with all these cucumbers? 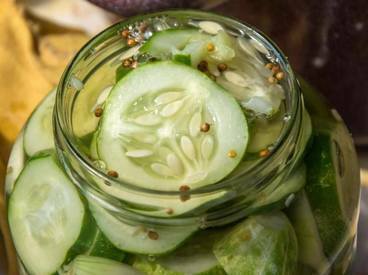 Well, you can make your own pickles. It’s fun and easy to do. If possible, buy your cukes at the farmers’ market or grow them yourself. Supermarket cucumbers are often coated with wax to reduce transpiration and keep them fresh, which interferes with the pickling.